We’d love your help. 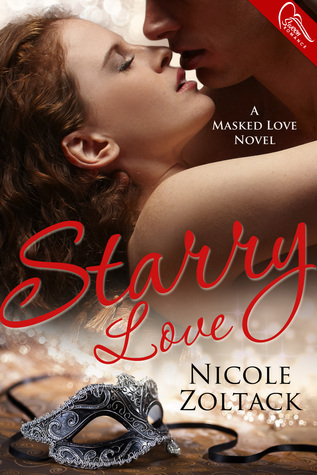 Let us know what’s wrong with this preview of Starry Love by Nicole Zoltack. Her mother is desperate and hails for doctors, surgeons, even apothecaries. The upkeep of the house Lady Elizabeth is more than happy for her brother Lionel, who found love with the beautiful Lady Theodosia. Now it is her turn with the Season rapidly approaching. But then her father is stricken deathly ill, and love of any sort except familial is all Elizabeth can think of. Her mother is desperate and hails for doctors, surgeons, even apothecaries. The upkeep of the house falls on Elizabeth and she spend long hours beside her father, watching as he betters one day and fares worse on others. Long walks with the stable hand Callum on starry nights save Elizabeth's sanity. To ask other readers questions about Starry Love, please sign up. Lady Elizabeth is more than happy with her life in the country; she has her father, family, her horse and her friend. She is crushed with her father's sudden illness. She finds comfort with Callum, the stablehand. Her mother frowns on the growing friendship and takes Elizabeth to London to catch a husband. A colorful cast and whirlwind adventure make up this entertaining story! Received book free for honest review. This story of Lady Elizabeth and stable hand Callum will keep you throughly entertained. The story all the twist and turns toward true love has great flow to it. It also brings in the characters from Ms Zoltack's first book in this series. I did receive this book from the author to review. Starry Love is book two in the Masked Love series. I have not read book one, but the author does a great job of catching you up so you do not feel at a disadvantage. In Starry Love, Lady Elizabeth and her family are preparing to go to London for the season. Her parents are hoping she will marry a husband who can take care of her. Lady Elizabeth's brother, Lionel, found love last season. As they are preparing to leave for London, Elizabeth's father becomes very ill with yellow fever. Elizabeth fi Starry Love is book two in the Masked Love series. I have not read book one, but the author does a great job of catching you up so you do not feel at a disadvantage. In Starry Love, Lady Elizabeth and her family are preparing to go to London for the season. Her parents are hoping she will marry a husband who can take care of her. Lady Elizabeth's brother, Lionel, found love last season. As they are preparing to leave for London, Elizabeth's father becomes very ill with yellow fever. Elizabeth finds herself caring for her ill father and her mother who is struggling emotionally. When Elizabeth needs comfort, she seeks it from her horse. She sees the stable boy, Callum, and begins a friendship with him. She is able to draw strength from him and he is thoughtful in the way he tends to her and her horse. She finds herself falling in love with him. But there are clear class lines drawn by Elizabeth's mother. She does not feel as if Callum can adequately provide for Elizabeth so she tells him to leave her daughter alone. Elizabeth longs for love like she sees in her parents and her brother. Elizabeth and her mother exhaust all of the treatments of the doctors in the area so they turn to apothecary, which is often frowned upon. The treatment does not heal her father, but it does extend his life. Callum remembers a healer in his home country of Scotland, so he leaves and heads to seek a treatment that can save Elizabeth's father. On the way, he encounters obstacle after obstacle and is delayed. He does not reach Scotland. While he is being held captive, he realizes his love for Elizabeth is strong but he knows he has nothing to offer her. Meanwhile, Elizabeth's father dies but Elizabeth and her mother head to London for the season so that Elizabeth can keep the promise to her father and find a husband. Despite the parties and the Lords that are interested in Elizabeth, her heart is already Callum's. Callum heads to see Elizabeth in London. His intent is to let her know she deserves more than him but what happens is unexpected to say the least. This was a must read after reading book one. It picks up Lady Elizabeth's story and her family. It takes you through sickness in the time fram, how by a certain age you had to marry and the love forbidden between social levels. It brings in the way doctors treated their patients as well. I believe this book was better then book one, and kept you wanting to find out what happens next. I believe this is a tough read because it is written in the language back then. Lady Elizabeth York is heading to London to find a husband when her father falls gravely ill. Elizabeth's mother will do anything to try and cure her husband and will seek the opinion of anyone she thinks can help them. While Elizabeth waits for her father to get better she soon begins a friendship with the stable hand named Callum Bryce. But as much as Elizabeth wants more of a relationship with Callum she knows that society will frown upon it. When Callum believes he knows someone who can help Lady Elizabeth York is heading to London to find a husband when her father falls gravely ill. Elizabeth's mother will do anything to try and cure her husband and will seek the opinion of anyone she thinks can help them. When Callum believes he knows someone who can help Elizabeth's dad he sets out on his own journey but will he be too late? I enjoyed this book and all of the different things that were involved in it! One part I really enjoyed was the medical aspects and reading all of the different ways of treating Elizabeth's dad. I can't imagine how difficult it would have been for people living back then compared to the medical treatments we have these days. It was interesting at the end how the choices that Elizabeth's mother made ended up affecting Elizabeth's place in society. I felt bad for Elizabeth as she was told she could only marry someone that her family deemed acceptable. With Callum the two formed a friendship and both loved horses and they just talked through things. She was extremely caring and she was willing to give up anything for her dad. Callum was a great character and I loved the effort he went to for Elizabeth and her dad. Even though he knew that Elizabeth's mom did not approve of him at all. He went above and beyond what most people would do! I really liked the character of Sophie Wortham and I hope the author writes a story on her next! When she’s not writing about knights, superheroes, or witches, she enjoys spending time with her loving husband, three energetic young boys, and precious baby girl. She enjoys riding horses (pretending they’re unicorns, of course!) and going to the PA Renaissance Faire d Nicole Zoltack is a USA Today bestselling author who loves to write romances. Of course. She did marry her first kiss, after all!